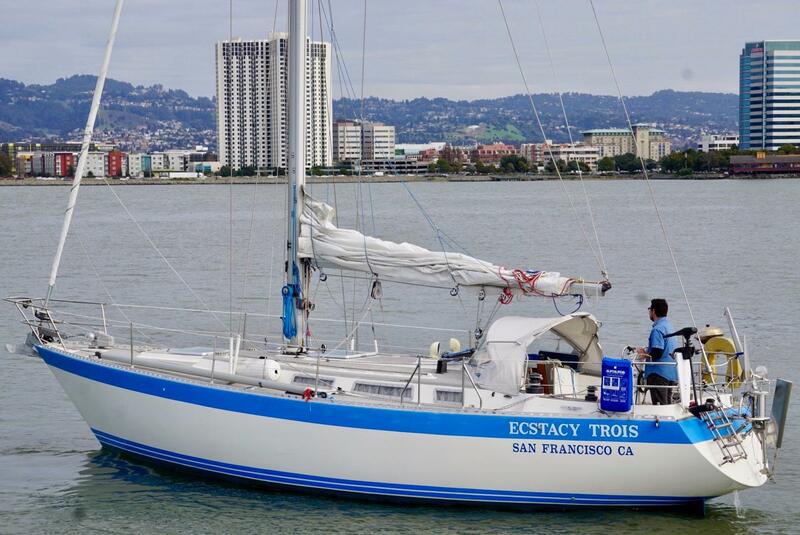 ECSTACY TROIS is a Mark II model of the popular Wauquiez Hood. The preferred Mark II model offers direct access to the companionway from the cockpit and an improved interior layout. 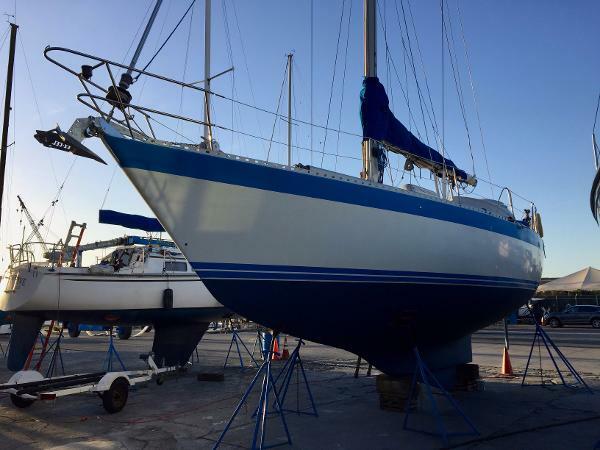 She was ordered without teak side and fore decks eliminating extra maintenance of teak decks and the added worry of water intrusion into the deck core. 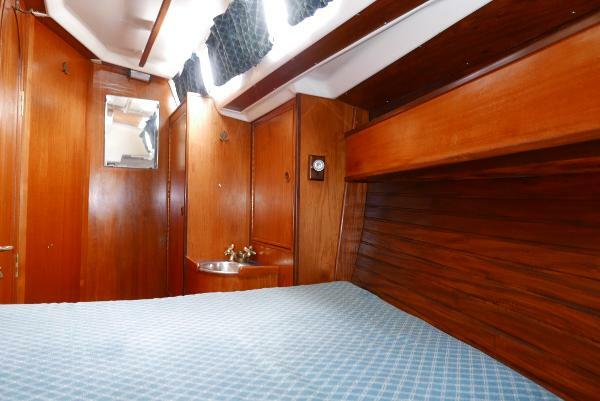 She is a remarkable sailor, her interior is clean and she ready to enjoy. 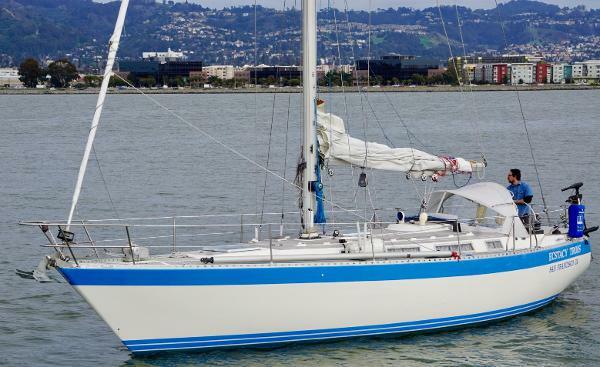 Ted Hood, an America's Cup skipper, a sailmaker, yacht designer and builder, created the perfect yacht with the Hood 38. 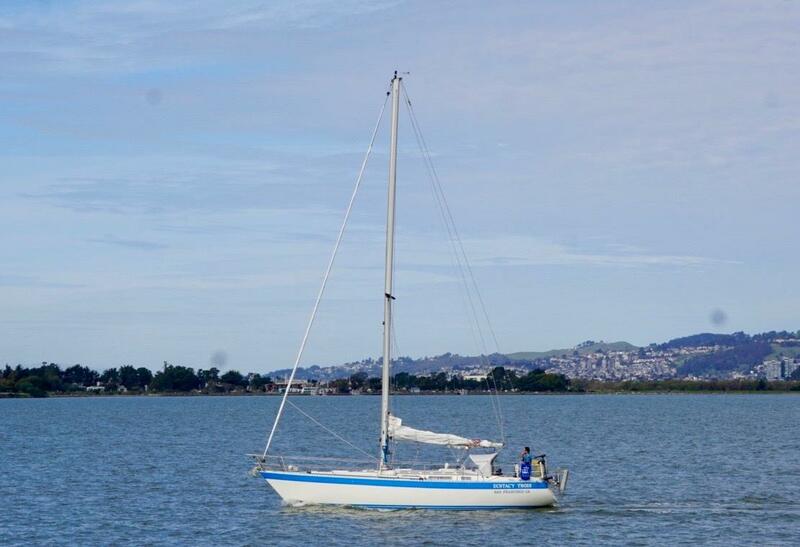 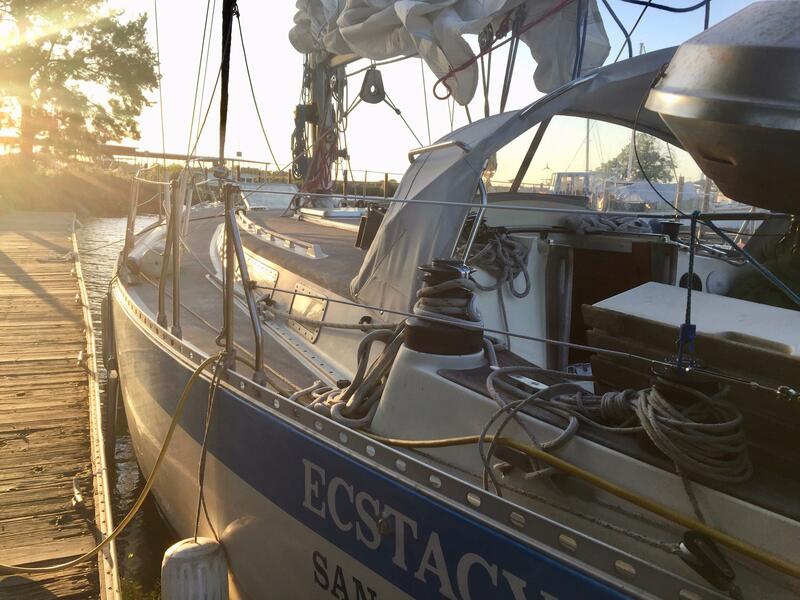 She is both fast and extremely seaworthy. 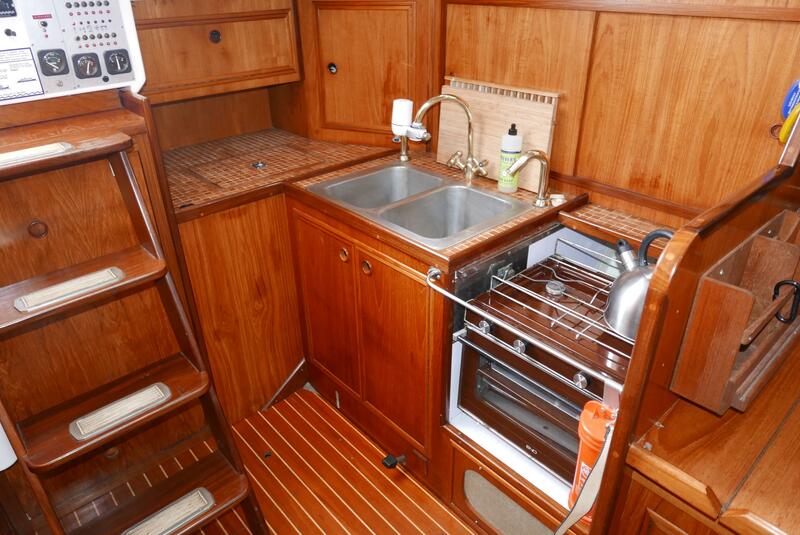 Ted Hood considered the Hood 38 his best design and for decades his family yacht was a 38 named Robin. 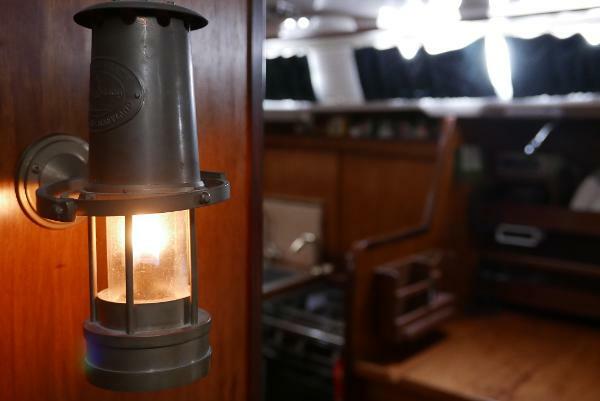 The design was so well regarded that three manufacturers (Little Harbor, Bristol and Wauquiez) used the same design to make their own versions of the 38. Of the three versions, Wauquiez is reported to have the best build quality. The Hood 38 design is unique in that it is heavy (23,300 lbs) but fast, even in light winds. 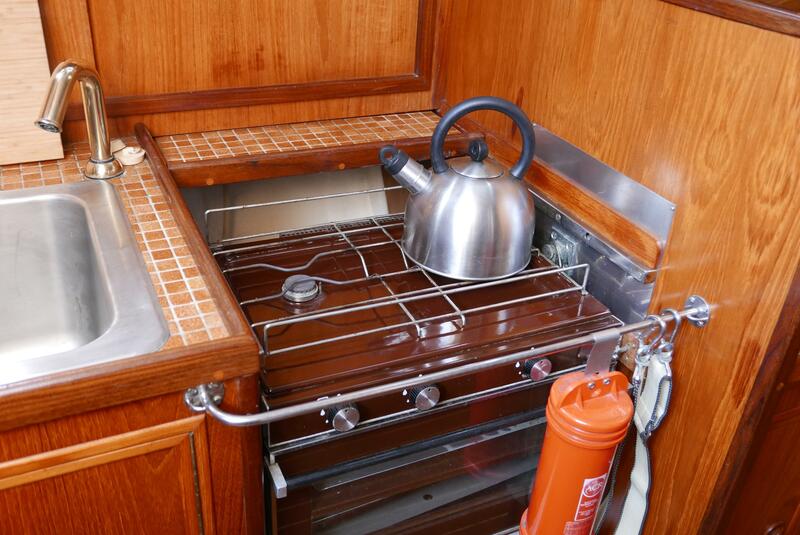 Hood decreased the amount of wetted surface on the design allowing these normally contradictory features (heavy and fast in light air) to coexist. 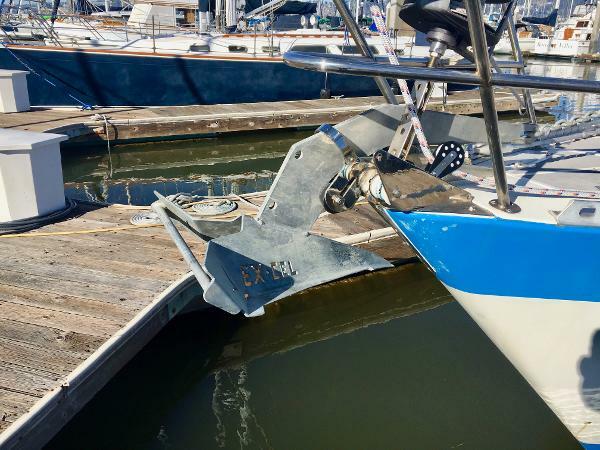 About half the weight (11,000 lbs) of the Hood 38 is in the keel which gives it a very impressive capsize ratio of 1.65. 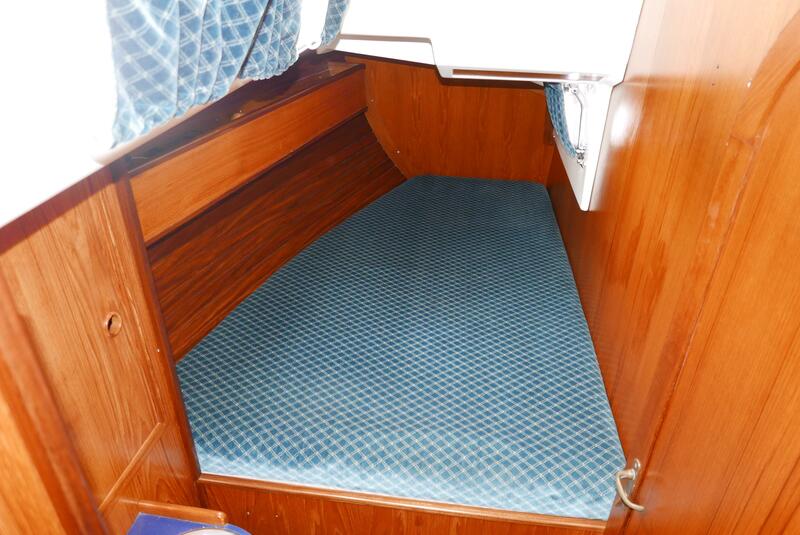 It has a motion comfort ratio of 41 making it extremely comfortable at sea. 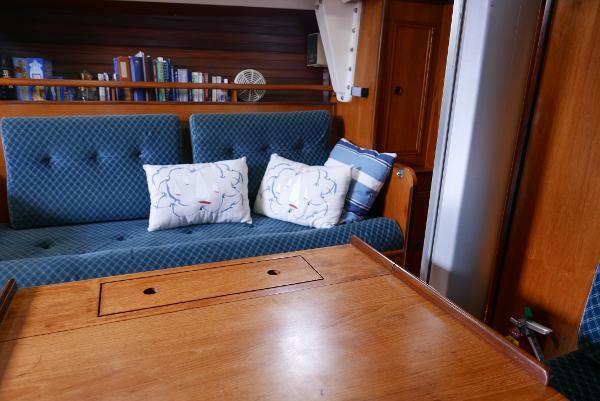 A more comfortable boat allows crew to be well rested (and less seasick) which makes for a safer and more enjoyable offshore passage. 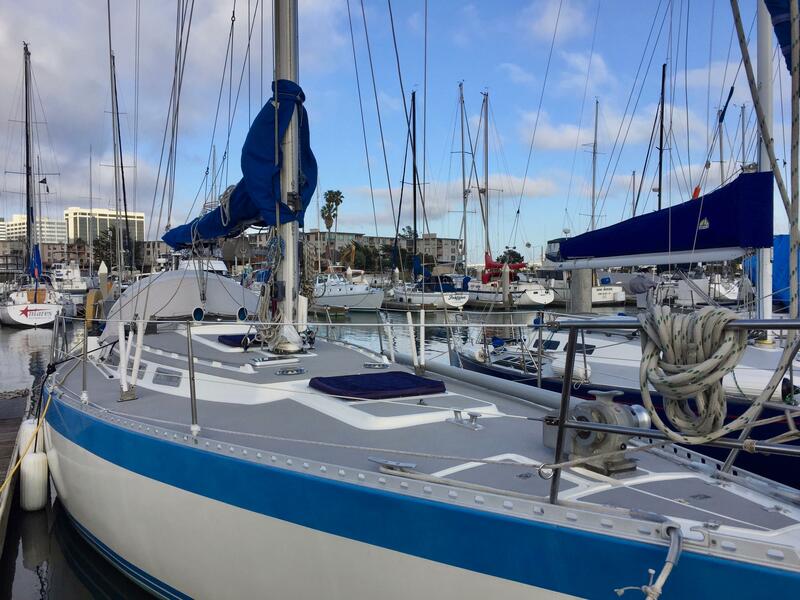 With the centerboard down, the draft is almost 11 feet allowing excellent upwind performance but with the centerboard up, the draft becomes 4.5 feet allowing the boat to tuck in close to shore in shallow coves. Cruising in the delta or anchoring in the Bahamas is not a problem with the Hood 38. 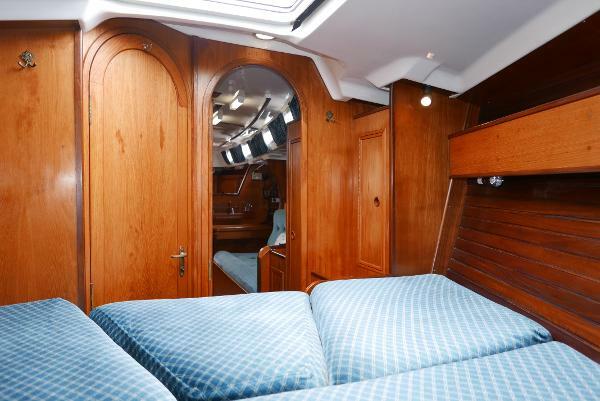 Wauquiez yachts are undoubtedly among the very best 80's era yachts in terms of build quality. 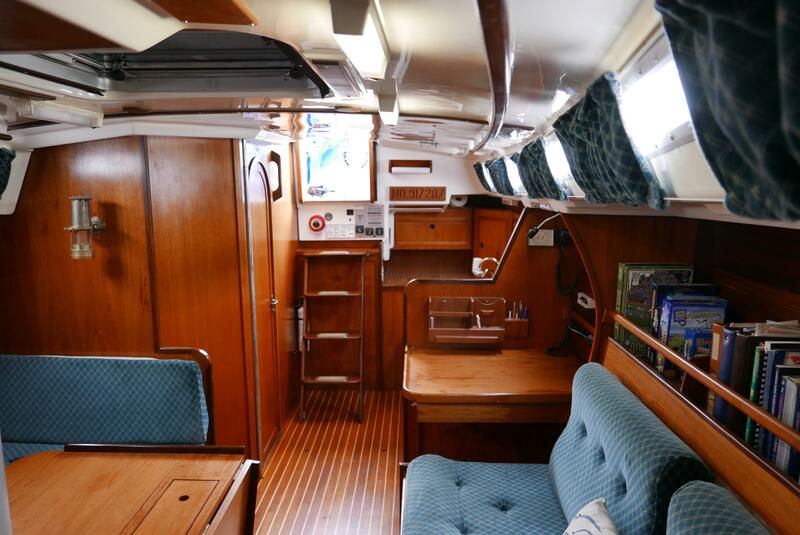 The gel-coat work on the Hood 38 is exceptional, the teak joinery below is simply elegant, even the interior cabin overhead is gel-coat. 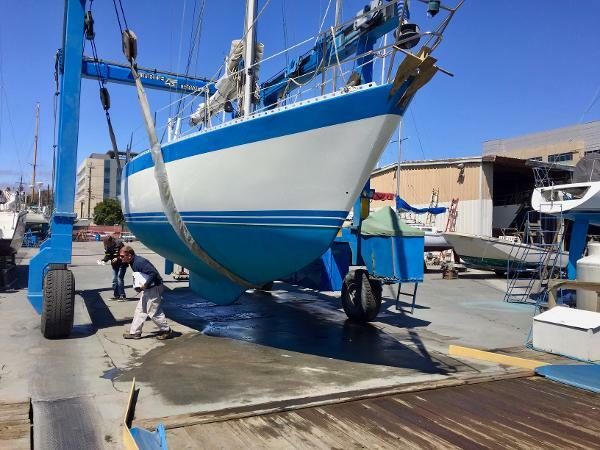 The solid fiberglass hull is all hand laid and very thick. 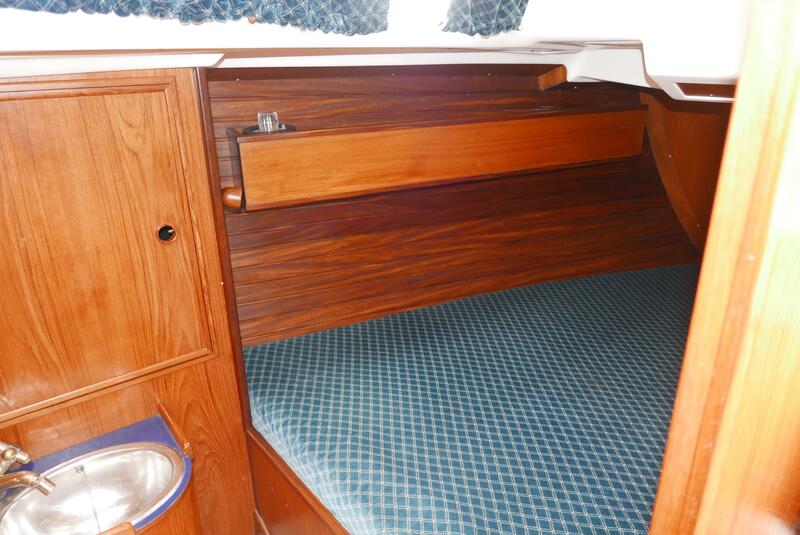 The bulkheads are bonded directly to the hull, not to the headliner or inner molding. 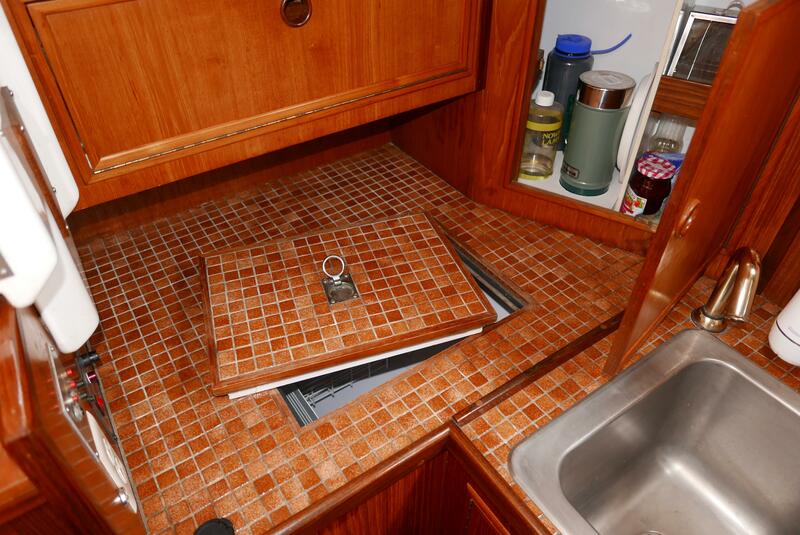 The build quality is evident everywhere you look including when opening access hatches and cabinet access doors. 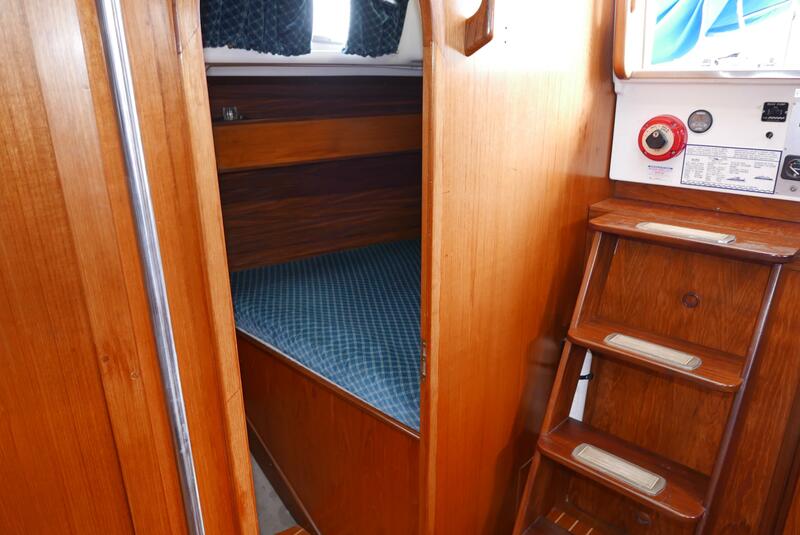 The V-berth on this model is one of the largest of any. 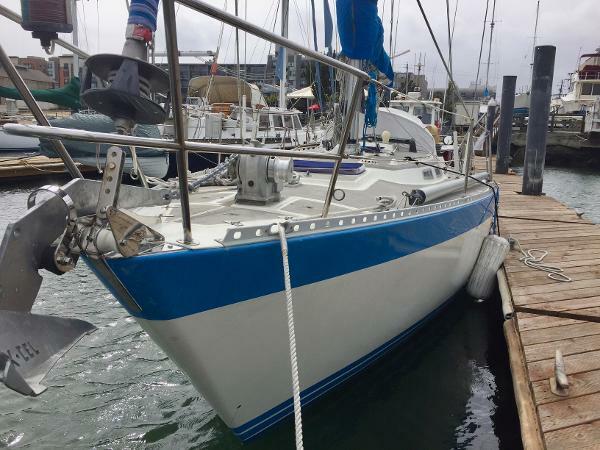 This vessel is well capable of taking you around the world, as many have done in Wauquiez 38's. 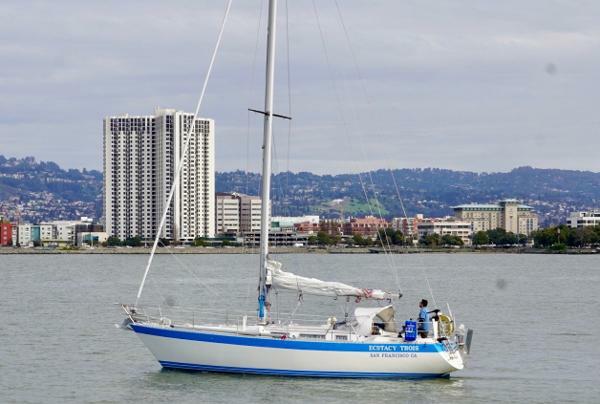 With its PHRF rating of 129 you could also do well in class races close to home. Sleeps up to (4) owners/guests in two double staterooms plus a double convertible main cabin dinette and and single settee berth for a total of (7) overnight accommodations; one enclosed head with integral shower. 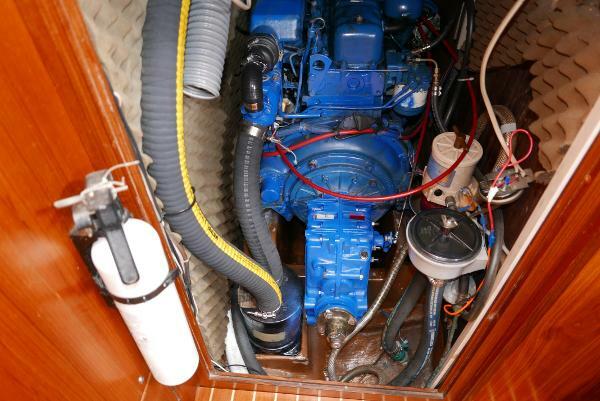 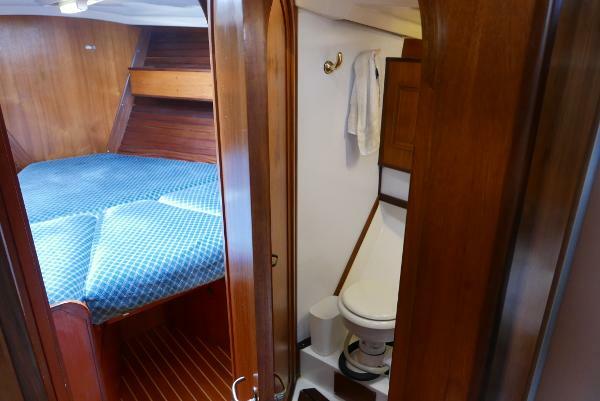 LAYOUT FROM FORWARD: Chain locker is followed by the FORWARD CABIN, featuring V-berths with filler; opening overhead hatch; built-in locker and drawer storage; handy private entrance to the FORWARD HEAD on starboard; and privacy door aft. 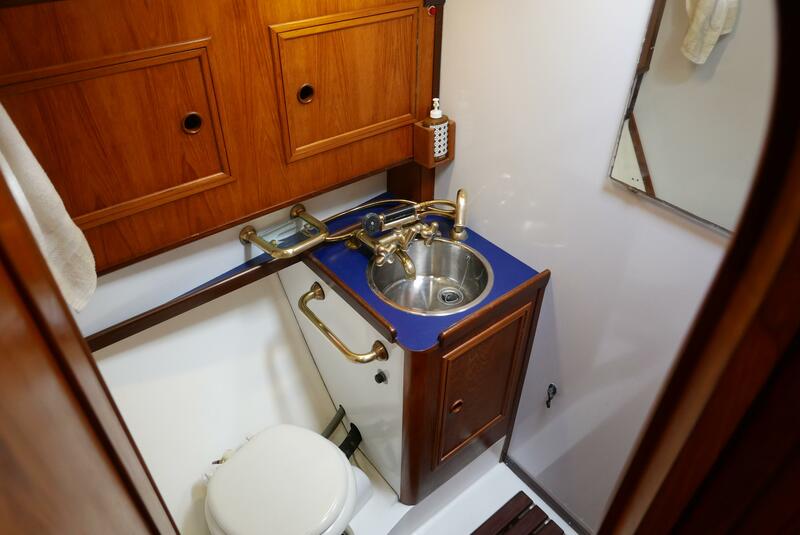 Following is general access door to the starboard FORWARD HEAD compartment with manual toilet and integral shower; to port is a counter with additional storage. 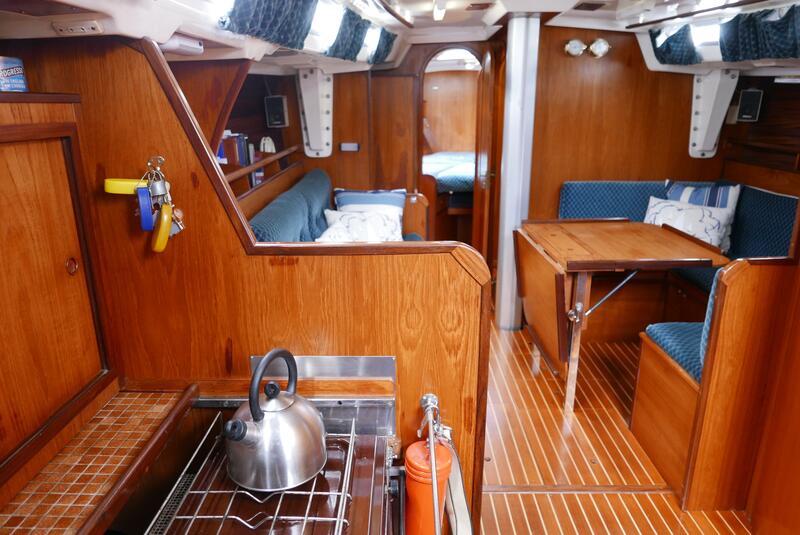 Next aft in the MAIN CABIN is a spacious convertible U-shaped DINETTE to starboard and a straight settee opposite. STORAGE is built-in beneath the seating along with shelving and cabinets outboard. 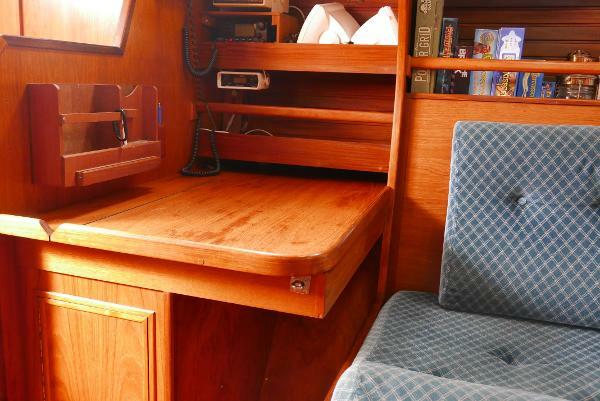 Aft of the settee on port is the well-appointed NAVIGATION STATION, with chart table; storage; and adjacent electrical control panel. Finally aft to port is the U-shaped cruising GALLEY; centerline is the ENGINE COMPARTMENT and removable steps up and out to the ample COCKPIT. Finally aft to starboard is the AFT CABIN with standing headroom at the entrance; stainless wash basin; large locker and double berth stretching aft with inboard and outboard opening portlights. 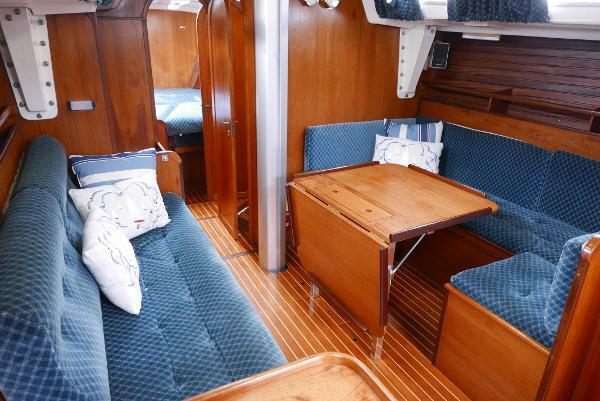 INTERIOR aboard ECSTACY TROIS is in beautifully crafted teak paneling and joinery. Natural light and air abounds with three opening overhead hatches in addition to the companionway, along with four portlights at each side. 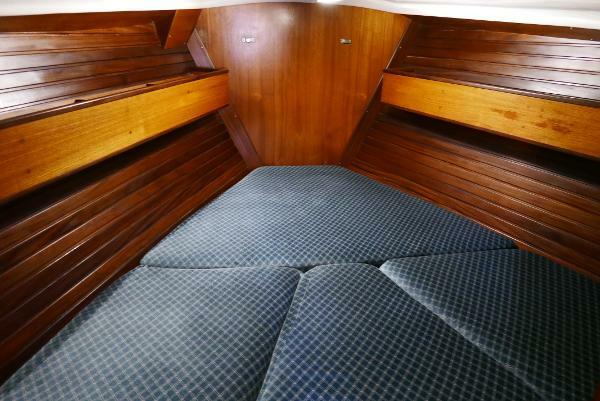 Upholstery is in excellent condition, as is the teak and holly cabin sole and the rest of the interior! 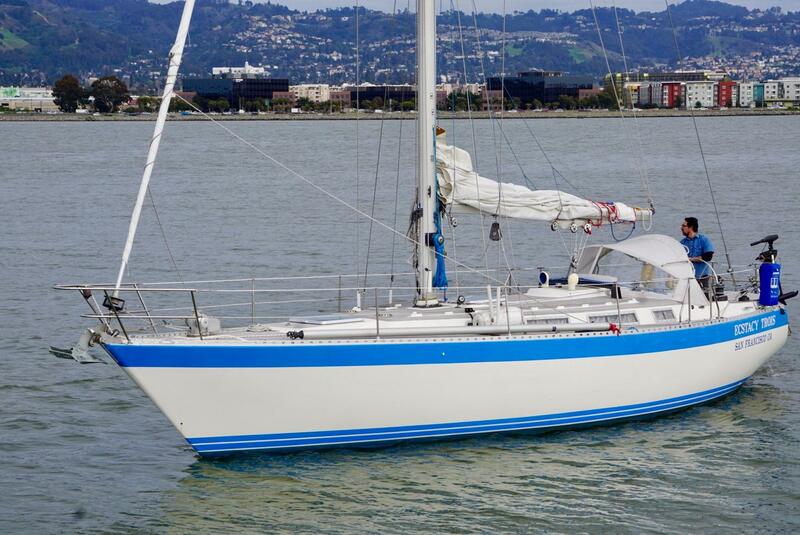 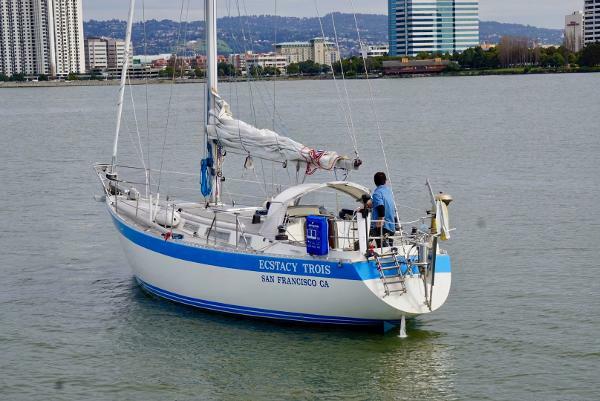 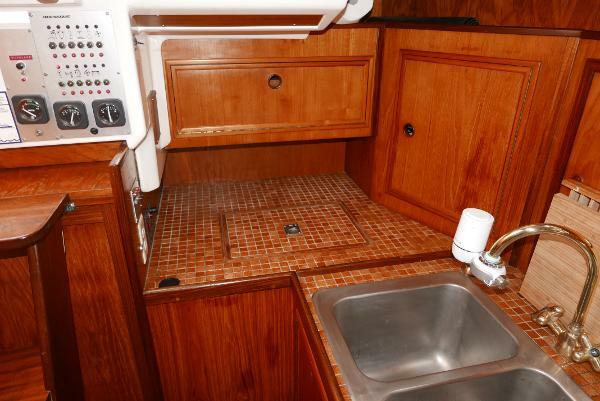 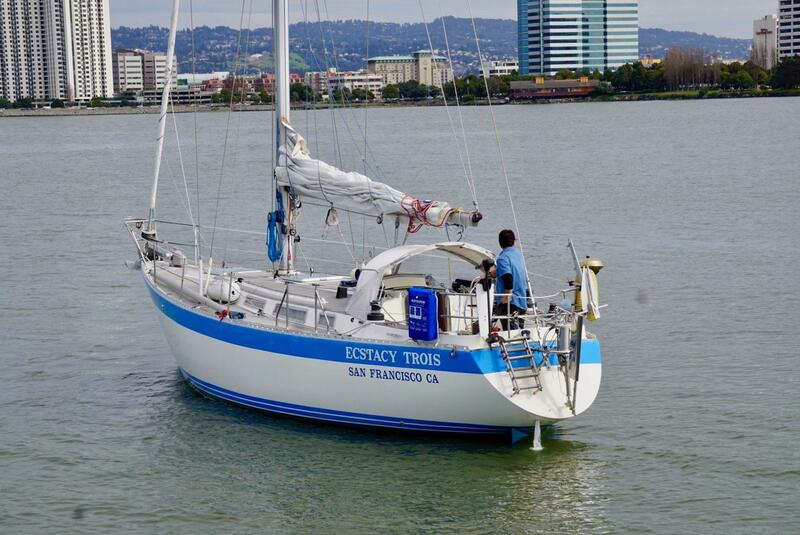 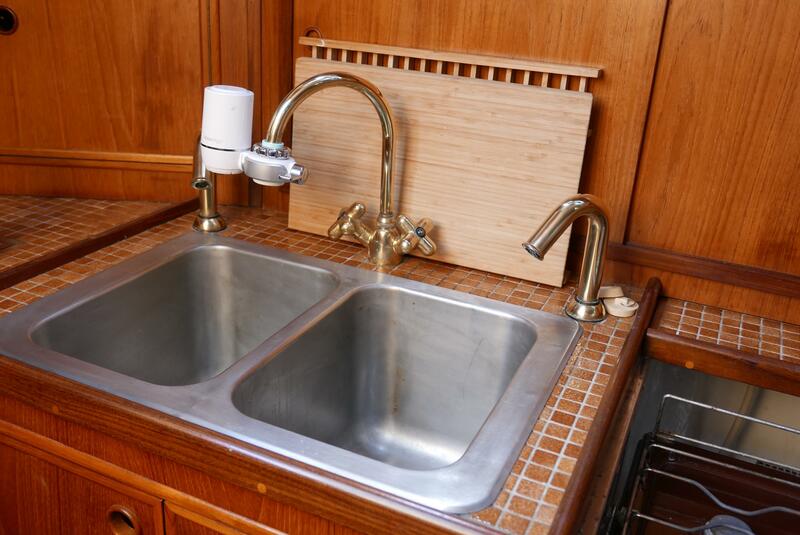 The yacht features a comfortable midships GALLEY at the base of the companionway that offers great counter / prep space, large double stainless steel sinks, hot & cold pressure water system, ENO 2-burner LPG galley stove, tile countertops with teak fiddling; and ample cabinet and drawer storage for wares and stores. Replacement of stainless steel centerboard wire with dyneema. New centerboard sheaves and hardware. 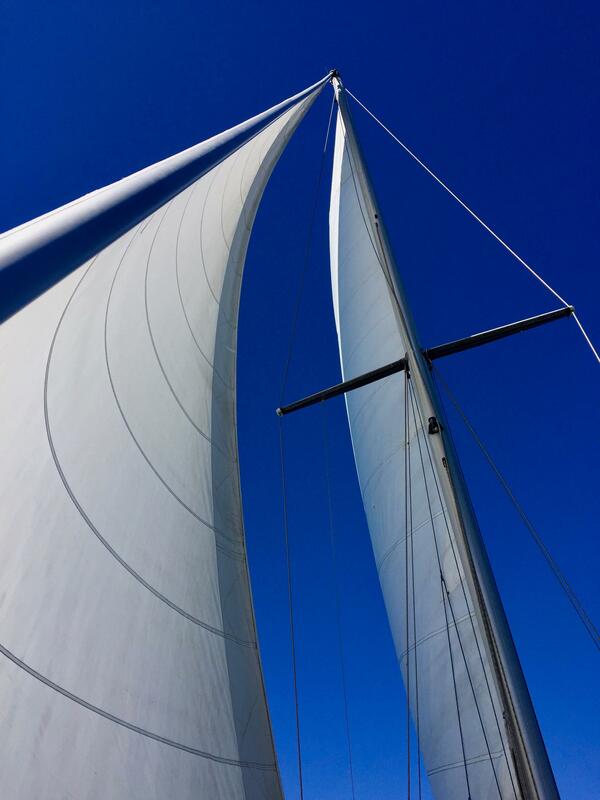 All sails are in decent condition.